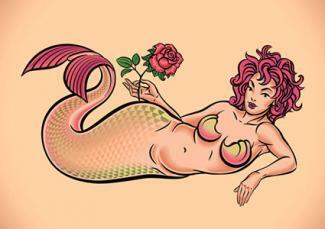 Mermaid tattoos have been popular with sailors for hundreds of years, but many other people admire them as well. What is it about these watery beauties that has captivated people through the centuries? Are mermaids a myth? Are they real? Does it even matter, as long as you can enjoy the mystery? Nearly everyone has heard the tales of a mysterious sea creature sighted by sailors and swimmers. These stories reach as far back as anyone an remember, and although the tales vary, there are several main themes they all seem to have in common. First, there's the description of the creature itself. There seems to a consensus that the mermaid is half woman/half fish, although there is the occasional mention of a merman. The face of this elusive creature is nearly always described as beautiful. She has been said to either have full lush hair, or trails of seaweed instead of human hair. Sometimes she is described as having a combination of both. Her upper torso is said to be human, so images usually include slender arms, full breasts and a trim waist. From the naval down, the mermaid is a fish. Shapely hips are covered in iridescent scales that taper down to a full tail fin. Although the mermaid's beauty is said to be quite enticing, it's her voice that draws men to her. It has seldom been reported that she speaks a word; it's her song that mesmerizes anyone within ear shot. In most cultures, the mermaid is depicted as treacherous. She uses her beauty and her siren song to lure her victims to her whether they are hapless sailors or beach goers. Once within reach, the mermaid captures her victim in her amazingly strong embrace and carries him down to the depths with her. Since no one has ever reportedly survived such an attack, it can only be presumed that the victim drowns. All you are left with is a vision of a femme fatale of the ocean, but no understanding of her motivation. Is it any wonder that mermaid tattoos are such popular designs? The combination of danger and beauty is almost too fascinating to resist. Traditional Mermaid tattoos are usually inked in full length body poses, often positioned across an arm or leg joint so the wearer can make the mermaid move. One particularly popular placement is down the arm crossing the elbow joint. A simple back and forth movement makes the tail move as though the she-creature is swimming. Placing the tat across the stomach muscles can deliver the same effect. It's actually one of the most amusing things about having a mermaid tattoo. 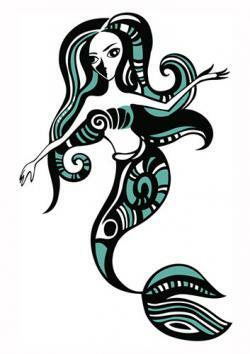 Perhaps you'll use one of the designs described below as inspiration for your own mermaid tattoos. Feel free to take an idea and personalize it for your own. Mermaid on a rock: There are many tales of a mermaid who positions herself on a rock jutting out of the shallow sea, waiting for someone to happen along. Perhaps she's beckoning to you? Sensuous pin up mermaid: The mermaid lends herself nicely to the pin up girl treatment. After all, she's a sultry, seductive femme fatale, isn't she? Mermaid combing her hair: This is another traditional view of the mermaid, running her shell comb through her luxurious locks. Daughter of Poseidon: Some legends hold that mermaids are the daughters of the sea god Poseidon. She could be depicted on a watery clamshell throne or with her awesome father. She could even wield his mighty trident to cause a tidal wave. Let your imagination run free with this theme. The little mermaid: Maybe there is such a thing as an innocent mermaid. Perhaps a little mer-girl frolicking with fish is your idea of a nice tattoo. Sea goddess: Many people not only believe in the legend of the mermaid, but also that she is actually a goddess who has dominion over all the creatures of the sea. Mermaid sleeves: If one mermaid is good, imagine an entire mermaid/ocean panorama covering an entire arm, or perhaps both arms. What a great theme tat. 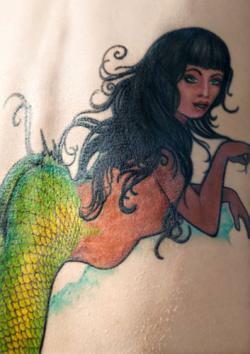 Mermaid tattoos and legends are intriguing whether or not you believe the tales. The images are certainly great inspiration for detailed ink work, and they can be interpreted in so many ways that it's always easy to create a completely original design.